Executive Director of the Gender Education Center and a Transgender High School Media Specialist (who transitioned on the job in 1998 & retired in 2001 after 32 years in education). A Minnesota non-profit corporation of differently gendered people dedicated to support, advocacy & education. We specialize in coordinating workplace gender transitions for transgender employees and managers. To enter this page, click anywhere on Debra's picture! This web site was developed & designed by Debra Davis. She created it in the early days of the internet, in HTML and periodically updates it to keep it current. * "Debra Davis Transgender Advocacy Award" UW Stout, WI. - Named after Debra & given each year starting in 2014"
* Curve Magazine's "2006 - Making Waves Award" - "One of six trans activists every dyke should know about." * "2005 PRIDE Award" for people who "embody PRIDE: rallying individuality, diversity & equality." * Human Rights Campaign - "2001 Bryan Coyle Leadership Award." * Twin Cities Pride 2000 celebration's "Grand Marshal" (Minnesotas summer LGBT celebration with over 400,000 participants). 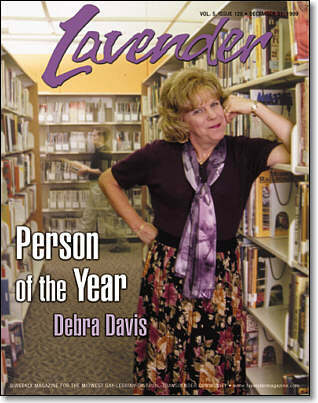 * Voted Best of GLBT Community Activist in 2000 by a Creme de la Creme readers poll. * Recipient of the 1999 Human Rights Fund Award by Philanthrofund Foundation. * Recipient of the 1998 Acts of Resistance Award by GLBT Youth Network Building Conference. * "2004 Diversity Program if the Year Award" from Northern Michigan University - MI. * 2004, 1998, 1996, 1995, Spokesperson of the Year by the City of Lakes Crossgender Community. * "Strength, Courage & Leadership While Working for Equality & Justice Award" in 2003 by OutFront Minnesota. * 2004 Outstanding Leadership in Community Activism Award, by Madison Transgender Association. There is Power in Pride! "closets are meant for clothes"
and overall concept of their Web page. transgender people and their families. Together we can all help make a better future for us all. the medical community & the general public. We work with the LGBT and transgender communities in our fight to keep the human rights we fought so hard to acquire, for ALL people. We continue to play a roll in defending these rights. There is still much work to do.